If you are like me, I'm sure you know the importance of having high speed internet and of course, TV! As a blogger, I am constantly updating, posting and of course, interacting with all my readers. If my internet is down, I'm down. And that's not good! Now, I have to tell you about this wonderful new service I was recently introduced to. Frontier Communications, which is available for all my local CT readers and at a wonderful cost. I want to talk about everything Frontier Communications offers. From their incredible plans and pricing to their even better customer service and everything in between. 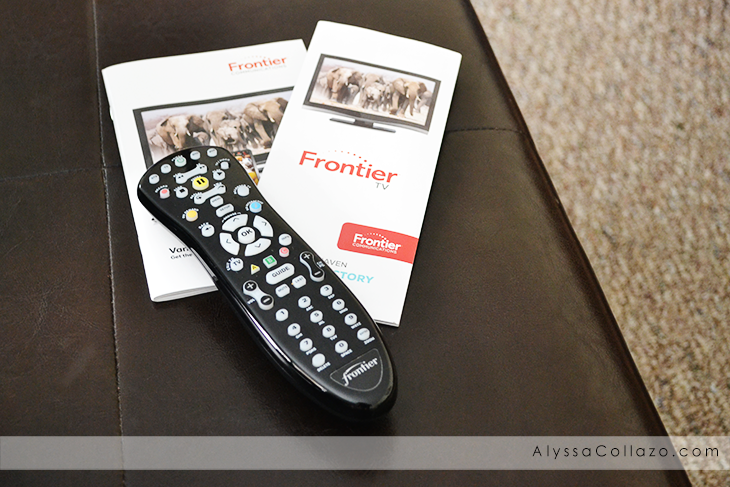 Let's start with their TV plan, Vantage TV - Frontier offers hundreds of channels the whole family will love! Like my daughters favorite Disney Junior or my favorite Food Network.. They even have a channel for Netflix! No more flipping from TV to Xbox. Simply set up your Netflix account and there you go! No hidden fee's. No hassle! It's definitely one of my favorite features Vantage TV offers. I can watch OITNB while I blog. It really is perfect. But that's only one of the many things Vantage TV offers! Stay tuned as I learn more about these features that I just can't wait to share with you. And on that note, let's jump into Frontier's High Speed Internet plan. You have a choice with Frontier. You can go with the basic Internet plan. Or, pick one with enough bandwidth to support the devices households run on. Personally, I like to go with a mid-range speed plan from Frontier. No more buffering for this blogger. The best part is Frontier Communications gives back to the community and proudly sponsors things like Connecticut's Beardsley Zoo (Which we cannot wait to visit), Webster Bank Arena, Connecticut Sun and so many more. With Frontier you get more than a wonderful plan. You get a company that cares about it's employees and customers. Frontier Communications has a mission and it's to make each and every customer happy along with giving back to the community. I've never seen a company so dedicated. Just like you, I am a new customer and while I learn I'll be sharing all my experiences with you! So please, stay tuned. I live and die by my internet speed. Everything I do is online, so I always need my internet to be as fast as possible. One of the most important things for me is my internet speed. I think I'll try Frontier Communications. One of the most important things when deciding on home things was choosing an Internet provider because all of my work and income is made primarily online. I went with Cox, but Frontier sounds interesting too! I have had frontier for soo long and I love it. Great post!! This sounds like a great company!! I hate that we only have the choice of one company in my area for high speed internet. Sounds like a great company. I like that it offers basic internet. Looks like an amazing company, I need high speed internet to work, this would be so beneficial!! I'm not sure if Frontier is available in my area. We've had some questionable internet service in the past so we're always looking for a reliable, fast connection. I love having a stable connection because I work online and it's tough to have an internet that goes out all of sudden. It would be great to have a service like this and with TV too, that's awesome. I rely on the internet a lot, especially since I blog often and it's important for me to have a good connection. This sounds like a great service! Oh, this company sounds a nice one. I love to have good connection because I am always using the internet for my work. I use the internet a lot. That means I have to get a higher speed. Sadly my internet has been pretty bad lately. I could go for something like this. I need to check it out! We have Frontier internet service - where I live it's the only option because we're pretty rural. It's better than the satellite service we used to have, but we've experienced some very slow speeds and lots of down time so there's still room for improvement in our locale - I'm sure that would be different if we were in a metro area, that being said when it works it's great. Wow, I love this. I hope there is something like this in our place. I am using the internet almost all day long. I wish we had this service in our area, but we don't. My in-laws have it and have never had an issue with their service. I also rely on my Internet everyday too. It's so hard when you are limited to the only provider in the area too. Next house we are buying will have options so that we aren't limited by crappy service. I don't have Frontier. I have to agree with you on the internet speed connection! Frontier Connection sounds like they offering some good deals! hahaha I am like you then :-) frontier sounds really awesome to use and offering great deals. I will have to check out Frontier Communications. It sounds like they have great deals. We need to change internet providers as ours is so slow which is a big issue when a blogger. My internet and streaming is everything! I would die if my service was not superior! I like to try this service. I hate to see my internet slowing down! I'm in NYC and I don't think they are available in my area. Sadly we have only one provider option where I am at and I am NOT happy with mine at all. It's not offered in my area, but it sounds quite promising! I certainly wish I could have a better internet service than Timewarner. This sounds like a great plan. We don't have many companies here in Canada to choose from, it's pretty much just Telus or Shaw! Oh yes, reliable Internet is a must for a blogger! Frontier Communications is not available in my area, but I do like that they give back to the community. Sounds like a great provider. I like that there are different packages to chose from. Online presence is essential for bloggers like us so companies like this and competitive offers like the ones you talked about are primordial to our very existence in the blogosphere!